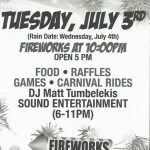 The Geneva American Legion #396 will host their Fireworks Festival on Tuesday, July 3rd, located at the American Legion grounds on Lochland Rd. The festival will feature food, raffles, games, carnival rides, DJ music, and fireworks at 10pm. Admission is $3 for walk-ins or $10 per carload. Rain date for this event is July 4th.